This article is about a level from Donkey Kong Country 3: Dixie Kong's Double Trouble!. For the similarly-named gameboard from Mario Party 3, see Creepy Cavern. Creepy Caverns is the thirty-second level in Donkey Kong Country 3: Dixie Kong's Double Trouble! It is also the second area of KAOS Kore. In the game's Game Boy Advance remake, it is instead the thirty-eighth level of the game, due to the addition of Pacifica. This cavern level features a new obstacle not found anywhere else. These rare obstacles are the tricky Boo Barrels, which appear throughout almost all of the level to aid the group in reaching the goal. 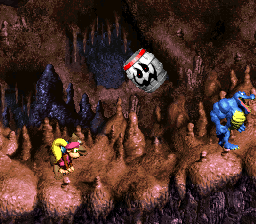 When using these barrels, however, the Kongs should be very careful, as they can appear and disappear suddenly, causing the monkeys to possibly fall into a trap. Some Boo Barrels can even blast the heroes into Buzzes. Though the level can be tough at times, Squitter the Spider is hidden just after the Star Barrel, and he can help the Kongs defeat enemies with his web projectiles. Krumples, Knockas and a single Booty Bird can also be found here to hinder the monkeys' progress. When the level begins, the heroes travel through the lowest part of the caverns, avoiding a few types of enemies, such as Krumples. Soon, they find a Boo Barrel that fires them to a higher area. In this area, the Kongs move down some stair-like platforms to reach a small set of barrels. The barrels fire the Kongs into a Boo Barrel, which shoots them into the next floor. There, they head west and avoid more enemies. Shortly after, the animals drop into a small gap and jump over a red Buzz to land in a tricky Boo Barrel. The barrel blasts them to another barrel, which then fires them into the next area. At this point, the group should make their way into another Boo Barrel and shoot upwards. The barrel shoots them, as before, into a second barrel, that takes them to the next area. In this area, the monkeys move under a Buzz, trying not to touch the appearing and disappearing Boo Barrel under it. Traveling a little farther takes the heroes to a raised platform with the Star Barrel. About halfway into the level, the Kongs pass some more enemies and jump over a lone Buzz, without bumping into the nearby Boo Barrel. They soon get in a Barrel Cannon that aims to another Boo Barrel. Once this Boo Barrel is aimed correctly, they should shoot into it and reach the next area. There, they avoid more enemies and soon find the letter N. If they continue on, they pass a few Knockas and make their way to a small gap. Falling into this, the apes avoid some Krumples and jump over a red Buzz again to land in a Boo Barrel. Without correct time, the Kongs hit into the Buzz under the Boo Barrel. Once this barrel leads them to a higher area, Kiddy Kong and Dixie Kong must travel to another Boo Barrel. When the barrel aims itself correctly, they should get in it and shoot to the top floor of the level. Moving under a Buzz and heading east over the rocky pathway, they use a Boo Barrel to shoot onto a high ledge. On the ledge, they head over and under some red Buzzes. Nearby Boo Barrels appear suddenly throughout this area to blast the heroes into these Buzzes. Once all the wasps are past, the apes need to roll into a small gap and jump upwards as they fall to land near a flagpole. If they raise the pole's flag, the level ends. K: Above and to the right of the first Boo Barrel. O: Above and to the left of a Boo Barrel in a part of the cave with a tall ceiling. N: Located below the Arrow Cannon access by finishing the second bonus room. G: Found at the bottom of a pit. Instead of following the banana trail over the pit, jump directly down it. Before the Star Barrel, the heroes blast upwards through a Boo Barrel between two red Buzzes and land in another barrel. The barrel blasts them to the right into the next area. There, the Kongs must head to the left and cross a small gap to find a Bonus Barrel. Using their Team-up move, the monkeys need to make their way into the barrel. It blasts them to a Bonus Level, where they need to use a Boo Barrel to collect many stars. Once all the stars are obtained, a Bonus Coin appears to the right. After the Star Barrel, the heroes see a Buzz guarding a barrel in the top of the area. If the monkeys manage to get in this barrel, they are shot to a crate with Squitter in it. They have to free the spider and head on to the next floor. There, they need to look above them to find a banana in a gap in the ceiling. Using Squitter's web platforms to get up there, they need to avoid the Boo Barrels and travel to a Bonus Barrel. It takes them to a Bonus Level, as usual, where they have to use Squitter's webs again to cross a few abysses. After they get through the obstacles, they find a Bonus Coin. Near the end of the level, the heroes see a Steel Keg. They must throw this barrel to the right, without hitting the nearby Buzz, and then quickly jump into the above Boo Barrel. The barrel blasts them to a Koin, who has the DK Coin. While in mid-air, the steel barrel thrown before hits him in the side. This defeats him, thus giving the Kongs the DK Coin. This page was last edited on April 10, 2019, at 13:51.